Can blue light cause AMD? Exposure to blue light has been linked to the development of age-related macular degeneration. Should we be taking precautions to avoid developing the condition? 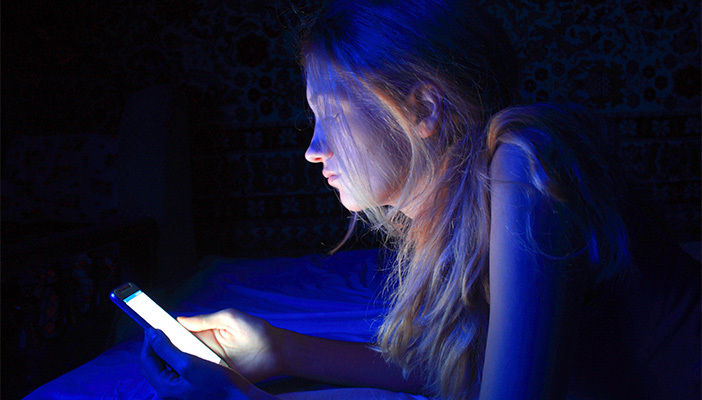 We may not be aware, but our eyes are regularly exposed to blue light. While this exposure comes primarily from the sun, LEDs (light-emitting diodes) which produce the light in screens for devices such as computers and phones, also produce a significant amount. Blue light is high-energy, short-wave light that is part of the visible spectrum. Whereas ultraviolet light (UV) is largely absorbed by the front of the eye, blue light passes through and reaches the retina. The potential damage to the retina caused by these wavelengths, due to their high energy, has been discussed for years. More recently however, several researchers have suggested that exposure to blue light might represent a risk for the development of age-related macular degeneration (AMD). The World Health Organisation reported that between 2012 and 2014 there had been a steep increase in the amount of time young people spend in front of tablets, computers and smartphones. Time spent looking at screens is regularly reported in the media, raising concerns about the potential side-effects such as disturbed sleep, mental health and reduced physical activity. Last month, Professor Christopher Hammond, Chair of Ophthalmology at King’s College London and Consultant at Guy’s and St Thomas’ NHS Foundation Trust, talked about blue light at an event at the Royal Society of Medicine in London. In his presentation, Hammond argued that there is not enough evidence to suggest exposure to blue light through LED’s is causing any significant damage to our eyes. Hammond believes that ultimately, given damage from blue light is proportional, we are exposed to it much more from the sun than from screens. “In a painstaking study of more than 5,000 people over the age of 65, in 2008 The European Eye Study found no link between blue light from outdoor exposure and AMD. The same report recommends that to be safe we should eat a healthy diet and continue to protect our eyes from the sun. In the absence of hard evidence proving blue light does not cause AMD, an increasing number of manufacturers have begun selling products that claim to protect people from blue light in digital screens. Products include yellow filters for glasses worn indoors. The Association of Optometrists (AOP) released a policy statement on blue light after a high street opticians were fined £40,000 for what BBC’s Watchdog claimed were “unproven health claims” about the effects of blue light. AOP’s statement said: “Coatings that filter visible blue light may improve visual comfort for some patients, or help mitigate the impact of visible blue light on sleep, but current evidence does not support making claims that they prevent eye disease. It is important that people spending significant amount of time outside in sunshine protect their eyes, particularly those in at risk groups. Equally, when using digital screens, we should take regular breaks and avoid looking at screens before bed in order to get a good night’s sleep and prevent eye strain. To find out more about keeping kids eyes healthy, check out RNIB’s Insight magazine’s four top tips from optometrists. Read more about how to protect your eyes from the sun. Visit RNIB's Eye Health pages to find out more about AMD, it's symptoms, causes and treatments.